Donald Trump tells Israeli reporter: "I haven't forgotten my promise to move US embassy." President-Elect Donald Trump landed Wednesday in Washington in advance of the inauguration events which will last over a few days climaxing at Friday's ceremony when he will be sworn in as America's 45th president. 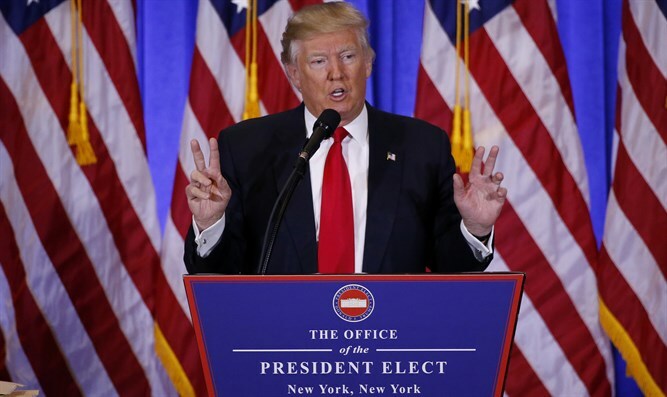 Israel Hayom reporter Boaz Bismuth spoke with Trump over the last few days and reminded him of his promise to transfer the American embassy to Jerusalem and recognize Jerusalem as the capital of Israel. "You haven't forgotten your promise about the embassy in Jerusalem?" asked Bismuth. "Of course I remember what I told you about Jerusalem. Of course I haven't forgotten and you know I'm not a person to breach promises," answered Trump. With reference to what is happening in Israel, Trump said: "I can't wait to start working with Israel. At the end of the week the relationship between us begins in earnest."